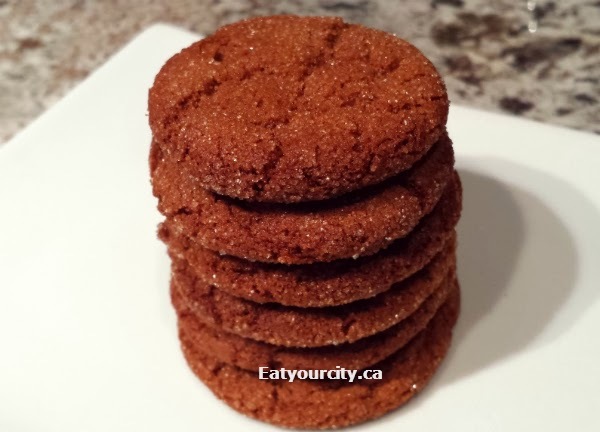 Eat Your City: Ginger molasses cookies recipe - you can make them soft and tender or into a crisp gingery gingersnap! 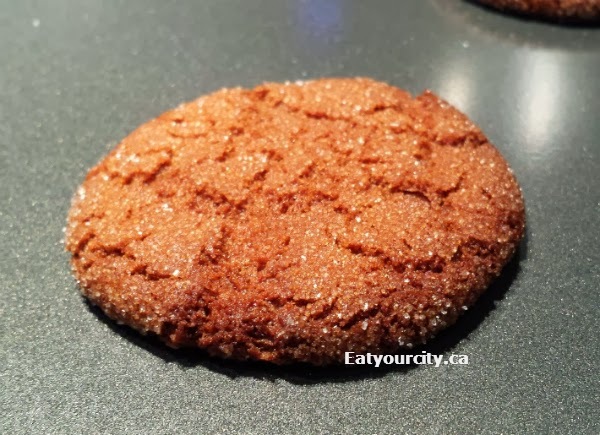 Ginger molasses cookies recipe - you can make them soft and tender or into a crisp gingery gingersnap! Posted by I adore ginger cookies. I love the scent it fills the house with, the zingy warm bite ginger adds to the cookies and the comforting memories it creates and evokes. I can't remember if I first had them from a friend's grandma, or a school bake sale, but a good ginger cookie is worth its weight in gold. Just like chocolate chip cookies, everyone has their own preference for either a soft tender melt in your mouth cookie, a crisp crunchy cookie, one with notes of molasses, fresh ginger, roasted ginger, candied ginger, spicy ginger... and it took a bit of experimenting, but you can customize this recipe to make the ginger cookie that'll bring a great big smile to your face! One of the key things when making ginger molasses cookies is to makes sure you give the dough time to chill and firm up a bit in the fridge. This prevents having the cookies turn out into super spread out oily disks in the oven (bleh). It also makes it easier to portion out and roll into balls and then roll into sugar before they're popped into the oven to get that wonderful ginger cookie scent permeating your home (yah!). Use parchment paper on a cookie sheet, or better yet, invest in really good non-stick heavy cookie sheets like the Wilton ones so your cookies cook evenly and don't stick! *optional* for a stronger ginger spicy flavor, you can add in an extra teaspoon of freshly grated ginger root. You can also add in 1/4 cut of finely chopped up candied ginger if you like. 1. Preheat oven to 375F. Beat butter, sugar, molasses and egg in large mixing bowl.. beat it until its nice and fluffy. You can use a hand mixer on low if you like... or work out those arm muscles! 6. Roll balls in sugar and place on a baking sheet with parchment paper or use a nonstick baking mat or non-stick cookie sheet (I love the heavy duty Wilton's cookie sheets!) spaced about 2 inches apart. 7. Press down slightly on cookie dough with the bottom of a glass or jar- to help them look nice and cook evenly. You can also use a cookie press if you're making lots to save rolling and smushing the cookie balls out. 8. For soft tender cookies: bake for 8-10 minutes. Let set for 1 minute on the cookie sheet, then transfer to cool on a cooling rack. For crisp cookies: bake for 10-12 minutes. Let set for 1 minute on the cookie sheet, then transfer to cool on a cooling rack.